Novice Group (Blue Sharks): ​ Practices from 3:00 p.m. until 3:45 p.m. This group is developmental, and is where new swimmers will learn the technique of all four strokes, as well as starts and turns. 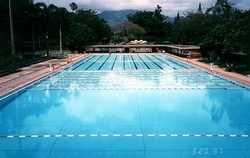 They swim in the 25-meter lanes. Intermediate Group (Great Whites): Practices from 3:00 to 3:45 (maybe longer, coaches decision). This group continues to work on stroke technique and starts and turns, but swim at increased speeds with less rest than the Novice Group. Advanced Group (Mako Sharks): Practices from 3:45-5pm. Practices are held year-round, Monday through Saturday (unless there is a meet), at the times noted above. Saturday practices are held from 9:00 a.m. until 11:00 a.m. The pool is closed on Tuesdays. The pool is closed the first Monday of the month for super-chlorination and lifeguard training. Swimmers are expected to attend practices a minimum of 3-days per week, but are encouraged to make as many practices as possible, especially as they advance in the swim groups. ​​*Parents are not required to sit and watch their swimmer practice every day, but should be close by and available for easy contact in case there is an emergency.